Horror movies are going through their own little renaissance right now, much like Disney did from 1989’s The Little Mermaid up to around 1999’s Tarzan. There are still a lot of terrible ones out there at the moment (The Gallows being a prime example), but it’s clear that filmmakers are starting to put a lot more thought into their movies and deliver something far more than just a simple jump-scare every now and then. As such, a lot of them seem to be new interpretations of classic sub-genres that are genuinely enthralling and creative in their approach to a tired concept – for example, The Babadook does something new with creature horror; It Follows reinvents the teen slasher; and now The Gift completely defies all expectations of a stalker movie – and boy, does it prove to be extremely effective as it does so. This is the directorial debut of actor Joel Edgerton, who also writes and plays a pivotal supporting player – he is Gordo, an old high school acquaintance of Simon (Jason Bateman), who has recently moved from Chicago to Los Angeles with his wife Robyn (Rebecca Hall) for his new job, and to get a fresh start after Robyn suffers a miscarriage. Gordo begins to drop by their house unannounced, sometimes leaving gifts for them that range from bottle of wine to an entire school of koi fish for their outside pond. Robyn seems to warm to him more than a weirded-out Simon does, and he orders him not to come by anymore – but all that does is open up a can of worms which we would rather not get too much into here, because what unravels deserves to be seen by a pair of fresh eyes. Edgerton has crafted a film that expertly plays with the expectations of the audience without ever leaving them unsatisfied, and it’s a marvel when you realise that this is his first film as director because it feels like it was made by someone who’s been doing this sort of work for years. He makes sure that you are not watching something like Fatal Attraction or Play Misty For Me, films that play more to formula and are thus more predictable (but still enjoyable), and keeps you on the edge of your seat with every plot turn because you have absolutely no idea where it’s going to go. One minute it hints about a certain direction, then the next it does a complete u-turn – it’s this sort of twisty nature that makes the film extremely intense for the entire running time, since you have no idea what is going on in certain people’s mindsets until the moment it’s revealed much later on. Helping its cause is the fact that, unlike a lot of horror movies recently – and that’s actually quite disconcerting – it’s actually very scary. It’s not a scare-a-minute type of film, but it’s more on how it plays on what’s there and what isn’tthat sends genuine chills down the spine. Even the jump-scares, which have become sort of a lowest-common-denominator in horror films, are absolutely warranted; there’s a great one around the mid-way mark where the cinematography and direction really helps elevate audience goers both figuratively and literally, and the same can be said about a later one set in a dark corridor at midnight. None of that, however, compares to the final few revelations which are so uncomfortably creepy yet so brilliantly executed that it’s more than enough to leave you feeling a little repulsed, in the best way possible. This is the kind of direction and writing that most stalker films need, and somehow Edgerton is able to find the right balance of scares and smarts in ways that have so rarely been done in this sub-genre. Similar to the likes of Clint Eastwood, Ben Affleck and others before him, Edgerton’s experiences of being an actor have also transcended well into the direction he gives to the on-screen performers. He makes the wise choice of casting himself as the ambiguously antagonistic figure of Gordo, who is more of a supporting player with not that many appearances throughout, while leaving the floor open to Bateman and Hall to shine throughout most of it. All three are truly on their game here, especially as the film opens up many possibilities about them that we hadn’t considered before – obstacles which they handle excellently and bring out some of their career-best performances as well. It’s hard to figure out what else to say about it without giving away any of the major reveals; it really is one of those films where the less you know about it going in, the more surprised you’ll be about what happens and to whom. We would even argue that it’s a little more satisfying than It Follows (though don’t get us wrong, we loved the hell out of that movie too) because it does everything that it can with the possibilities and runs with them in a way that leaves you completely fulfilled by the time it’s done, whilst also leaving selected things open for imagination. Edgerton turns out to be a whizz behind the camera, hiring excellent cinematographer Eduard Grau to create some intense and atmospheric shots that play on the suspense (sometimes, Gordo is just in the background watching the main characters, and you hardly even know he’s there). So far, we’ve had three great examples of a horror renaissance which The Gift is now a highly welcome part of. Now, can they PLEASE revamp that bloody found-footage gimmick as well, while they’re at it? 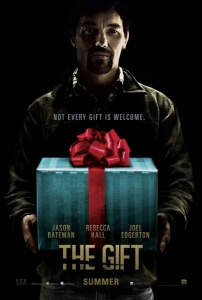 The Gift is a truly chilling and excellently crafted reinvention of the classic stalker horror, with Joel Edgerton proving to be a surprising whizz behind the camera and in front of it, alongside Jason Bateman and Rebecca Hall who also give standout turns, and giving its audience enough genuine scares to make a satisfying, truly Hitchcockian horror-thriller for a new age.